If you are sending your items interstate it can be cheaper to post them in pre-paid Australia Post satchels, especially if the destination is far from your location. For Example. You have an item which is small, 270mm x 200mm x 60mm, and 2.7kg. If you send this item as a regular parcel from Melbourne to Perth, the cost would be $22.30. 2. Offer Australia Wide Delivery - Since Pre-paid satchels are the same price no matter where you send them, you can fix your post costs. You will know how much to send all over Australia. As long as they fit into the Satchel! There are 500gram, 3kg and 5kg Prepaid satchels and the same in Express Satchels. Fixed prices to any destination around Australia. 2. Package items safely. When sending with satchels, don't just place them inside, you should place your items into cartons which fit Pre-paid satchels. You don't want your items loose in a plastic satchel, it is not safe from damage. Protect your items by placing them in cartons which fit into the prepaid satchels. 3. Buy satchels in Bulk. Australia post will provide a discount on pre-paid satchels when you buy them in lots of 10. If you know the size you will be sending in, then buy at least 10 a grab the savings! Buy in bulk, and you get an even lower fixed price! Pre-paid satchels can only be bought from Australia Post, but we can help you with cartons which fit them! What About Other Couriers who offer Pre-Paid Satchels? Absolutely! You can try companies like Couriers Please. 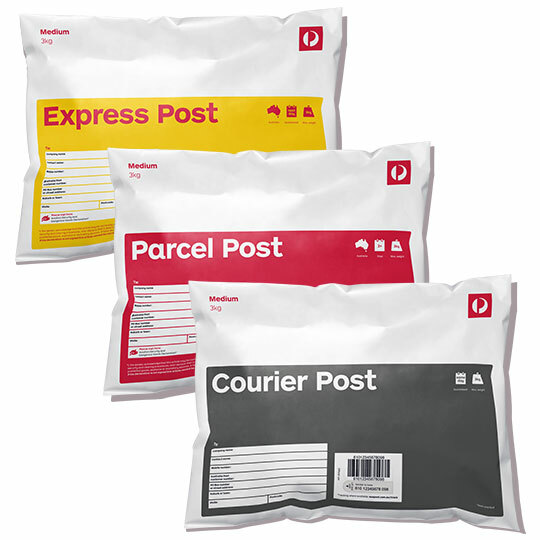 They can provide the same or even better pricing than Australia Post! But they do have restrictions on where they can deliver, so keep that in mind! They have a neat calculator which you can check if a standard satchel can be delivered without additional costs. They are fantastic for Metro deliveries, so we would definitely recommend looking into them! Officeworks have also started offering 'Mailman' prepaid satchels - might be a great option if you have a nearby officeworks or are in store already! Fastway do pre-paid labels, so you can affix these to your own satchels. Even Sendle do labels for fixed price. Super savy will work out the best mix that works for your customers locations and size of products! Now lets make sure you go the extra mile in making sure your customers talk about your products, service and delivery! Don't dull down the experience when they open up the anticipated arrival of their order!! Make sure their 'Buzz' of ordering is alive! Make the un-boxing more exciting!! Why not add some colour, and coloured gift box, or tissue paper, some personalised ribbon? How about a thank-you card, or a promotional thank you card which gives them or friend a discount on their next order? Go a step further to keep the fun-going with social media - why not ask them to post a picture to your facebook page of them opening up your order? Have your customers raving about the product, the packaging, and the delivery expierance!